After a long break without competition Saturday saw the Henley Juniors back with a vengeance at Hampton Head. This is one of the major junior heads with nearly 700 crews competing. Henley had 30 crews competing across both boys and girls and from the youngest under 13s at their first event to the top juniors who will be looking to compete for GB at this years Junior Worlds. The Henley juniors returned from the event with eight outright wins, two silvers and three bronze. The WJ15 quad of Holly Cookson, Georgie Pollard, Darcy Smith, Della Luke and cox Maddison Sturgess picked up a gold in what was the largest category of the day with over forty entries. The girls started first in their division and raced over the course at a solid a solid rate of 30 pulling away from the crews immediately behind them but kept the pressure on knowing there would be strong opposition further back in the field. 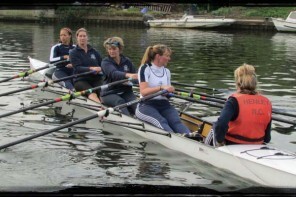 The girls won by 1.2 sec over Latymer Upper with local rivals Marlow in third place just over 6 sec behind. 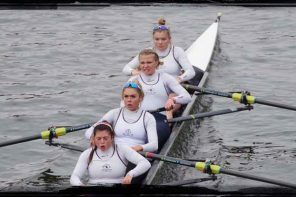 The WJ15 coxed four of Poppy Wilson, Holly Thompson, Emilia Fulford Dodson, Holly Nave and cox Chloe Beeton rowed well to pick up a third place in a boat category for which they have had limited boat time. They were just seven seconds behind Lady Eleanor Holles School who are perhaps a more recognised sweep club. Two wins in Division One were in the double sculls. The WJ16 2x of Carla Russell and Charlotte Rowley claimed the win by over 20 seconds. The WJ18 2x of Georgie Robinson Ranger and Lottie Orr also won by a similar margin. The WJ18 coxed 4 of Phoebe Fletcher, Grace Johnson, Alice Jones and Emeline Warner put in a strong performance to claim the win by 10 seconds. Phyllis Barter, Sophia Hahn, Daisy Butterworth and Rebecca Lister had a powerful row in the WJ 18 coxless 4 winning by just 0.6 seconds. The WJ 16 coxed four of Georgia Brown, Amber Weller, Phoebe Snowden and Amy Howard had a good row to come a comfortable second. Division 2 saw the girls race in the WJ18 eights, WJ16 eights and junior women’s quads. The womens junior eight of Phoebe Fletcher, Lottie Orr, Sophia Hahn, Mary Wright, Daisy Butterworth, Georgie Robinson Ranger, Phyllis Barter and Issy Jonsson claimed the win by 12 seconds after a stand out performance. Both the women’s junior 16 eights and women’s junior quad came in close second places in their events. After coming second at the previous three head races, the WJ 14 crew of Natalie Schoenmakers, Charlotte Beadmore, Laoise O’Donohue, Bea Bethell and cox Daisy Rolstone put in a commanding performance winning by 25 seconds over Guildford RC, with the Henley crew of Ella McKay, Josie Sawbridge, Mia Roullier, Cleo Davies and cox Kiran Drennan coming in 1 second after Guildford to claim third. Henley boys J15 – 18 squad had a disrupted day at Hampton with no less than 4 boys off with “flu”; this led to last minute crew changes and scratchings. 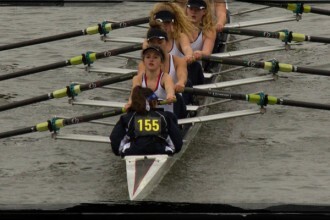 Despite this the performance of the crews in J18 quads stand out. Henley was the only club or school to have two boats in the top 10 in a top quality field of 30 crews. The crew of Balthasar Issa, Bruce Turnell, Ethan O’Connor and Lewis Howlett, despite having to race in a competitive vacuum because of a low start position, came 5th behind Maidenhead, Windsor Boys School, Westminster School and Tideway Scullers, but ahead of local rivals Leander and Marlow. The B crew of John Yolland, Oliver Taylor, Seth O’Connor and Joe Sidgewick came 10th.